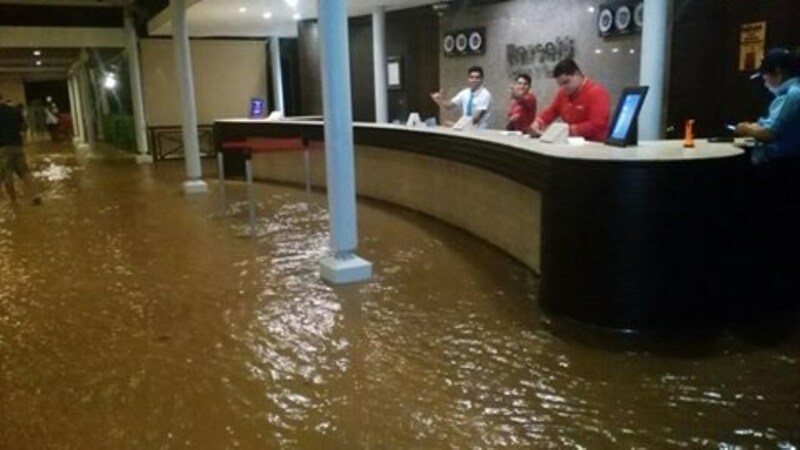 The lobby and first floor of the Hotel Barcelo in Playa Tambor was flooded Monday night. Photo from Telenoticias video. (QCOSTARICA) A total 40 rooms at the Playa Tambor hotel got were flooded Monday night due to heavy rains and a creek overflowing its banks. The report by La Nacion says the information comes from the Fire Department (Bomberos) and Red Cross (Cruz Roja) stations in Paquera (Puntarenas), while the hotel declined to comment, the legal department telling the publication it would issue a statement on today (Tuesday). 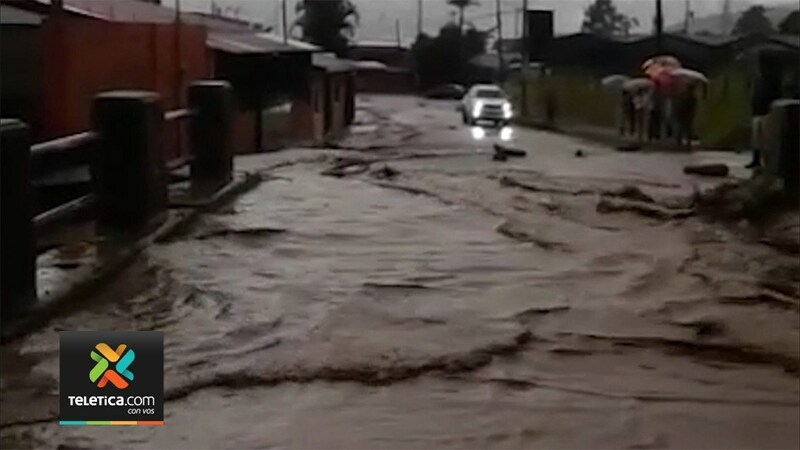 The Cruz Roja and Bomberos report intense rains starting around 5:30pm affected the villages of Corales and Valle Azul, causing the Rio Grande de Paquera to overflow into nearby properties. The call at the hotel came at 6:23pm. The flooding occurred in the first floor of the hotel, that included rooms and the lobby. Hotel staff and guests moved to a safer area in the hotel. 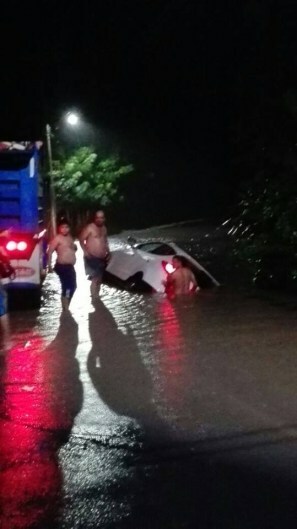 In Puriscal, the rains caused a series of landslides, cutting off traffic on the main road and trapping some 25 people in 14 vehicles. 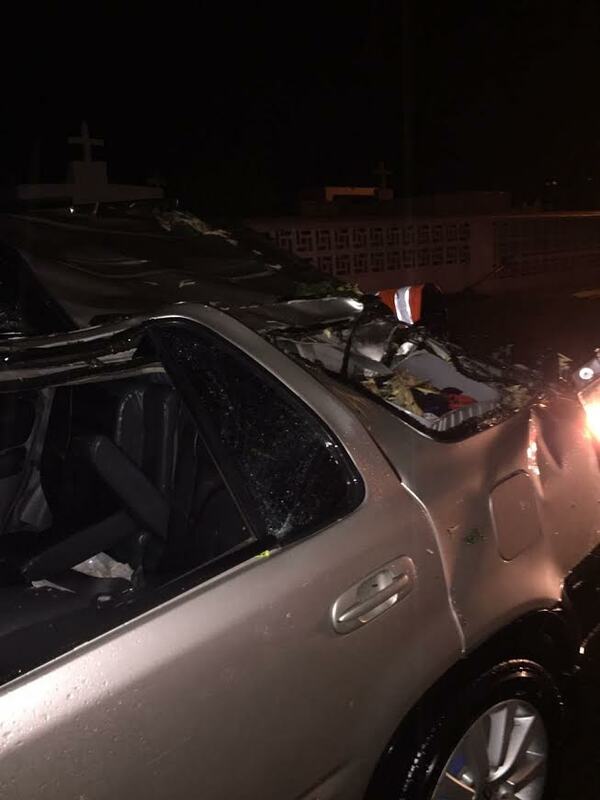 In one report, a tree fell on one of the vehicles, hitting and injuring a three year-old girl who was treated for a major head injury at CAIS Puriscal (local clinic). The constant rains on Monday are due to a low pressure system over the country, causing an unusual all night rain in many parts of the country. October is known as the worst of the worst of the rainy season that ends by the middle of November. So far this month we have recorded almost equal to the average rain for the month. And there is still more to come, according to forecasts by the national weather service.